Any Miranda Kenneally story is a win in my book. She always writes about athletic teens who grow personally in some way during the course of the book and end up with a great guy. Defending Taylor falls right into that camp. Taylor is the "perfect" teen. Hard-working, intelligent, athletic, poised. She manages to work super hard, but look like everything comes easily. This is crucial for her, being the daughter of a prominent politician and the youngest of several "perfect" siblings. Of course, the book starts out by us witnessing the fallout of Taylor needing to be perfect. She's caught with her boyfriend's stash of Adderall (which she has occasionally indulged in). Being the perfect girlfriend and *not a snitch* is one of her other "wonderful" traits, and she takes the fall for him. I really did not like that Taylor let herself take all the blame for the Adderall, including getting kicked out of school. I hated her skeezy boyfriend for letting her accept the blame. And I hated her parents for being more focused on being politicians with the perfect image than caring about their daughter. That said, I can see why Taylor made that decision. I think it was a very bad decision, but I can understand why she logically decided to do what she did - even though I think she was stupid. It's a short-sighted, teenagery thing to do - albeit loyal. Ezra, the boy interest, was a good guy. He's taking time off to find himself (in the context of the book, it's not as losery as it sounds). He also has had to dig out from under the overwhelming expectations of his parents. Once I knew the reason he left school, I was able to sympathize with him much more. Although overall he's not the type of guy I find attractive. I thought he was a great match for Taylor and a kind and gentle person. 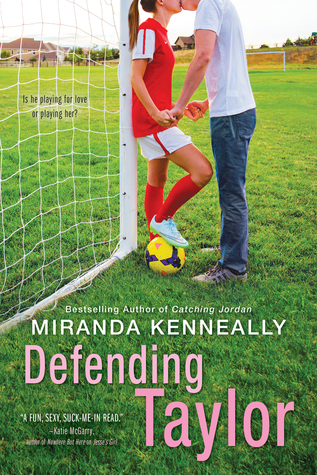 Even though sports features in all of Miranda's books, you could have left soccer out of this entirely and had just as good a story. Sports are more prominent in some of her books than others and this was probably the least use of sport in any of her books. I missed it. The soccer aspect made for a nice subplot and helped tie her to her new school, but it also was resolved too summarily. The overall message in this book is to not push yourself too far. Not that you shouldn't aim high and work hard, but that you shouldn't get so caught up in achieving that your whole life explodes. I think the book demonstrates this value well without getting overly preachy. All in all, not my favorite of Miranda's books, but still a solid and fun read. Recommendation: Buy if you're a Hundred Oaks series fan. If you're new to the series, read her other books first. I'm looking forward to this one, but I'm not too thrilled about Taylor's parents.